With the election of Donald J. Trump, many people on both the left and right feared that America's 240-year-old grand experiment in democracy was coming to an end, and that Sinclair Lewis' satirical novel, It Can't Happen Here, written during the dark days of the 1930s, could finally be coming true. Is the democratic freedom that the United States symbolizes really secure? Can authoritarianism happen in America? 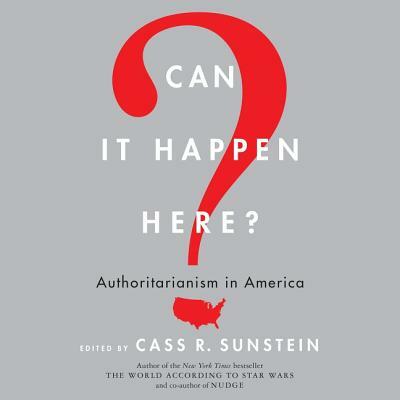 Acclaimed legal scholar, Harvard Professor, and New York Times bestselling author Cass R. Sunstein queried a number of the nation's leading thinkers. In this thought-provoking collection of essays, these distinguished thinkers and theorists explore the lessons of history, how democracies crumble, how propaganda works, and the role of the media, courts, elections, and fake news in the modern political landscape--and what the future of the United States may hold. Martha Minow, dean of Harvard Law SchoolEric Posner, law professor at the University of Chicago Law SchoolTyler Cowen, economics professor at George Mason UniversityTimur Kuran, economics and political science professor at Duke UniversityNoah Feldman, professor of law at Harvard Law SchoolJonathan Haidt, social psychologist and Professor of Ethical Leadership at New York University's Stern School of BusinessJack Goldsmith, Professor at Harvard Law School, Senior Fellow at the Hoover Institution, and co-founder of LawfareStephen Holmes, Professor of Law at New York UniversityJon Elster, Professor of the Social Sciences at Columbia UniversityThomas Ginsburg, Professor of International Law and Professor of Political Science at the University of Chicago and a member of the American Academy of Arts and SciencesCass R. Sunstein, Robert Walmsley University Professor, Harvard UniversityDuncan Watts, sociologist and principal researcher at Microsoft Research.